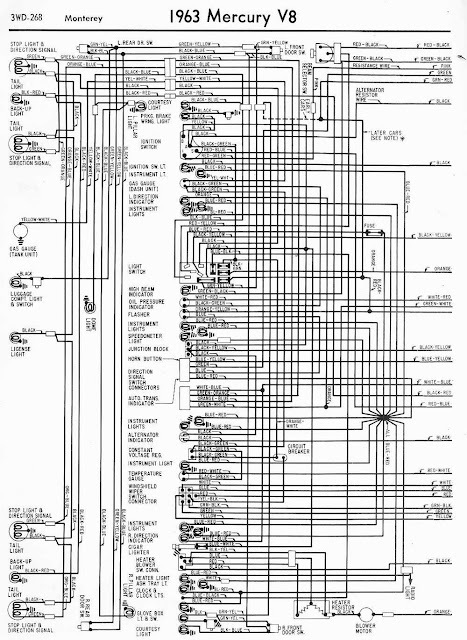 The schematic here is the wiring diagram of the 1963 Mercury V8 Monterey. The wiring diagram is divided in two different parts, here you can see the left side of the wiring diagram, and this is the Mercury V8 Monterey 1963 Wiring Diagram Right Side Part. As you can see, this wiring diagram is very clear, it shows many components and connections clearly. Some of the components you will see inside this left side part of the 1963 Mercury V8 Monterey wiring diagram are like: light switch, high beam indicator, oil pressure indicator, flasher, speedometer light, horn button, alternator indicator, etc. Be sure to study both parts of the wiring diagrams first before attempting any wiring work like assembly or troubleshooting in your Mercury V8 Monterey. Save this wiring diagram for free in your PC.